The first things I have observed were the green spaces, that were acetually taken care of, and the narrowness of the roads. The first two weeks the weather was excellent, only 2-3 rainy days. 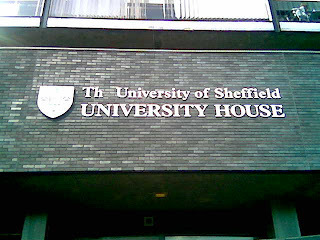 It took about 3 days to get used to the 25 minute walk from my accomodation to the Student Union building (actually, not the walk was the problem, but the fact I did it 2 or 3 times a day, and that Sheffield is a VERY hilly city ). Most the university buildings are within 5 minutes walk from the Union. Bus over here is quite expensive. The regular ticket is a bit over Â£1, and a student weekly ticket is Â£12. There are some lines though that have a special tariff for students, 50p per trip. I have thus got used to taking the bus to the university and returning by foot (or again by bus if it rains). It is diffrent from the bus in Romania in that you pay at the driver when you get on the bus, and usually the bus does not leave the stop until everybody pays (and everybody does). The bell actually works (the STOP button), and the driver does not stop unless you ring it. Cool, huh? One thing I have noticed is that everybody is very friendly and calm. When a car stops on the road, the other drivers wait for it to finish it's maneuver (like taking a right turn), and do not hurry to overpass it or horn. If you ask somebody for something, he does his best to help you. It makes no difference that you are a fresher (that is, first year student) and he is a professor. Another thing that kindof surprised me is that when you buy something that costs Â£0.99, you actually get the 1p change. I once bought something and did not wait for that change. Imagine the seller coming after me to give me my 1p change. In the international orientation week, they told us something like a joke: In Heaven the chef is French, the policeman British, the mechanic German, the organiser Swiss, and the lover Italian. In hell the chef is British, the policeman German, the mechanic French, the organiser Italian and the lover Swiss. This seems to be true. While the police here are very friendly, the food is at least wierd. Most mornings I eat egg and bacon, and for dinner, the potatoes (either fried or baked) are never missing. Lucky me I like fried potatoes, a dish that is called "chips" here. Although in the beginning I wasn't very happy with the food, I kindof got used to it, and now it's not a problem any more. Now about academic stuff... I have 6 courses this semester. Three of them are electronics courses: Circuits and Signals (mostly RLC stuff), Electronic Devices (that is, mostly semiconductors), and Digital Systems (well... the name says about what needs to be said). I also have Mathematics, Enterprise and Technology and the so-called Coursework. Electronic Devices is said to be the hardest course in the first year. Could this be why I like it best? The Mathematics really is a waste of time. Not only the difficulty is absent, but some of the british students ask the professor repeat or explain why (x1+x2)^2-(x1-x2)^2=4 x1 x2. Enterprise and Technology is part of the "with Business Skills" degree I have chosen and is interesting; it is not really aimed on learning, but on thinking about some details of the corporate world we all live in. What's left? The coursework... That is the codename for quite a number of things we do in the first year. Almost half of it consists of C Programming. The rest, well, is what we call labs. Just as an exampe, for the coursework we have to build a remote-controlled car until Christmas. There are lots of other things that go into the coursework section. I am going to end this post now, it's already getting too long. All in all, I like it here, and I had no problems getting used to living and learning in a foreign country.